POOL: The seventh round of the Patong Pool League (PPL), sponsored by Thailand Pool Tables, Genius 2 Garden and Restaurant and Tualek Whisky, was played last Thursday (July12) with league leaders Caddy Shack once again showing their form and again extending their league at the top of the table. In last Thursday’s action it was Wombat Bar’s turn to host league leaders Caddy Shack, and given Caddy Shack's recent performances it was a game Wombat must not have been looking forward to. Caddy Shack started as they meant to go on with Davy, Mark and Justin all winning their their singles and doubles games, and with the final score being 9-2 in Caddy Shack’s favour they proved that this season they are in a class all of their own. Reports have come back to The Phuket News that somewhat elated by their victory, the Caddy Shack limo took a detour home via Ting Tong, Natalie and Kwan’s Birdie Bar where they sat outside for quite some time with We are the Champions blasting out of the stereo. Meanwhile, Red Light Bar played away to Genius with Red Light eager to pull themselves away from the bottom spot in the league table by showing some strong fighting spirit. Tum, Brett and Gwen all won their singles and doubles games for Red Light while Jenny from Genius also done the same. The beerleg was a three-setter and after losing the first set Genius took the next two sets and won the beerleg. However, Red Light went home after pulling off a 7-5 victory over Genius and getting themselves two spots off bottom in the league standings. Elsewhere, Kiki Sports Bar played at home against Happy End Bar. William from Kiki Sports Bar just had an exhausting trip to Laos and this showed in his games. This was not helped with Andy from Happy End winning his first ever singles and doubles games in the PPL. Tak and Oye from Happy End didn’t miss out on any chances and also won their singles and doubles games. Top player Chris, also playing for Happy End, potted the black and another ball from the break and that was the end of his game. Happy End won the first set in the beerleg but Teacher Tak wasn’t only able to screw up the second set but also the third. However, despite their shortcomings in the beerleg Happy End still managed to take a 7-5 victory back to Soi Kepsub. It was reported that Teacher Tak was so embarrassed by his beerleg shenanigans that he went home with his head hung in shame. Martin Swiss played away to Kwan’s Birdie Team in Kathu and Goh, Riky and Mike E playing for the Birdie team each won their singles and doubles games. Word has it that Kwan’s Birdie Team still have aspirations to challenge Caddy Shack for the league title and that their top player Goh is now giving one-on-one private lessons to their new player Staf every day. Kwans Birdie Team took away 8-3 victory against Martin Swiss taking them to third position in the PPL rankings. Finally, Ting Tong Bar was played at home against Natalie Bar with Natalie and Oh both winning their singles and doubles games. The beerleg was also won by Natalie Bar in two sets and that resulted in a good 8-3 win for Natalie Bar. Following the game, Ting Tong owner Paul said that his team had learned a great lesson in pool that night but promised that his team will come bouncing back. 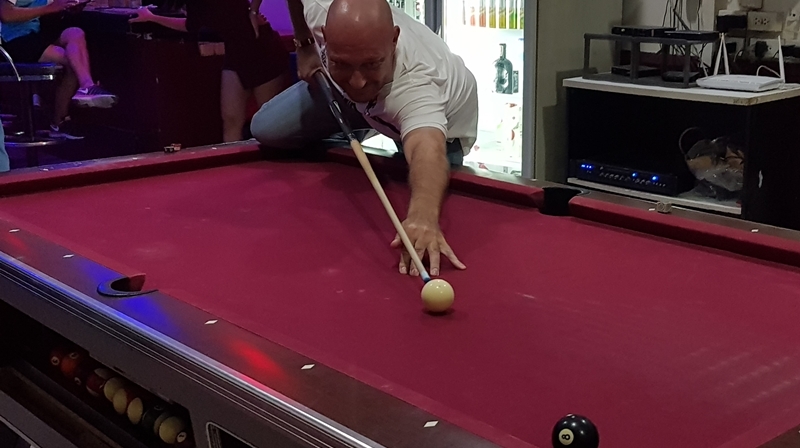 The eighth round of the Patong Pool League will be played this Thursday (July 19) and anyone interested in playing as well as visitors are all welcome to attend at one of the 11 participating bars. You can also visit the Patong Friendly Pool League Facebook page for more details n the league.